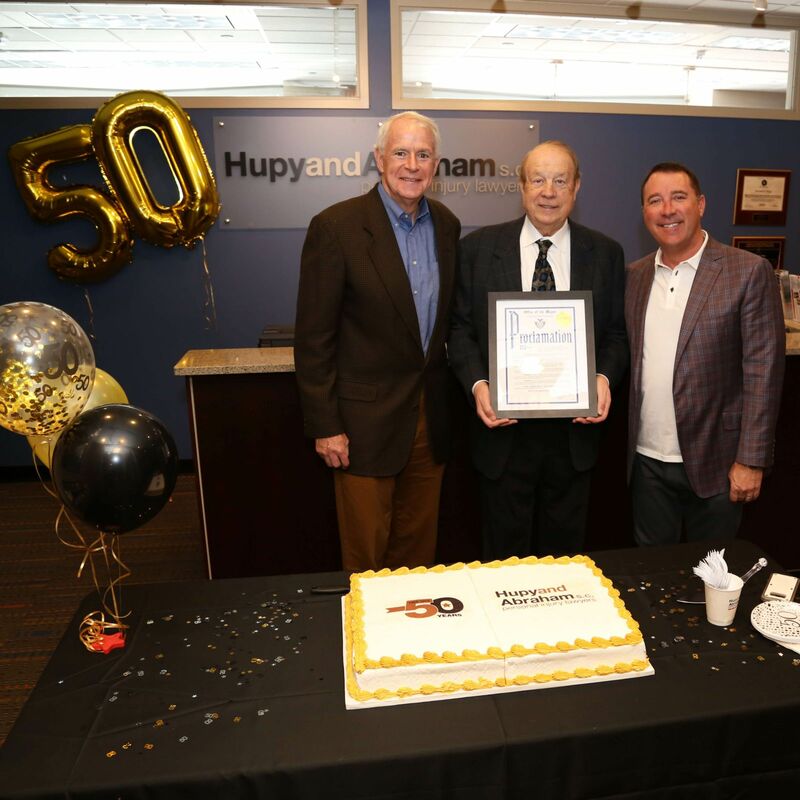 Hupy and Abraham Honors 50th Anniversary Through Change, Charity and the City | Hupy and Abraham, S.C.
Hupy and Abraham, S.C., personal injury law firm, is proud to celebrate its 50th anniversary in 2019. On April 15, Milwaukee Mayor Tom Barrett presented the owners a proclamation honoring the company’s milestone with a dedicated day. The roots of Hupy and Abraham can be traced back to 1969, with activist and attorney Lloyd Barbee. Attorney Barbee was an influential lawyer, activist and executive member of the Milwaukee NAACP. He is best known for starting the Milwaukee Public Schools Integration Lawsuit. At one point, he began working with Attorney Thomas Jacobson. In 1997, Attorney Michael Hupy bought out Thomas Jacobson and the firm was called Michael Hupy and Associates. Attorney Jason Abraham joined in 1993 and later became shareholder and the firm’s name was changed. The firm’s current “Hupy and Abraham” officially became the company’s name in 2006. In the past 50 years, the company has transformed from a single small law firm to 11 offices and nearly 200 employees dispersed throughout Wisconsin, Illinois and Iowa. Its staff has won over 250 awards and has obtained over $1 billion for more than 70,000 injured clients. The firm celebrated their 50th anniversary by revealing a new website, tweaked to accommodate modern changes that will allow viewers to have a smoother online appearance. Hupy.com will keep the same color scheme, primarily red, black and white. A new addition to the front page is a step-by-step guide for clients to explain a typical case process. These new adjustments have also translated to mobile. Hupy and Abraham also sponsored the “Get in the Game” project gallery which ran from winter to early spring 2019 and focused on Wisconsin’s best athletes. The exhibit is the first of its kind by solely honoring state athletes. Additionally, the firm held a charity donation poll, where supporters among the community’s promising nonprofit organizations could vote for a winner to receive a monetary gift from Hupy and Abraham. The poll winner was Camp Hometown Heroes who will receive the donation. The firm has donated more than $1 million to over a thousand worthwhile organizations. Hupy and Abraham will continue to have other commemorative activities through the rest of 2019.